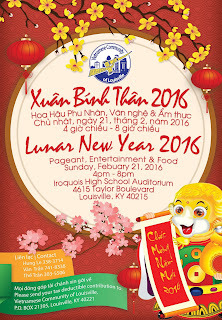 What’s your favorite Vietnamese restaurant in Louisville?...Beside Vietnam Kitchen. I know it’s an American favorite, but you don’t see many Vietnamese eating there for a reason. 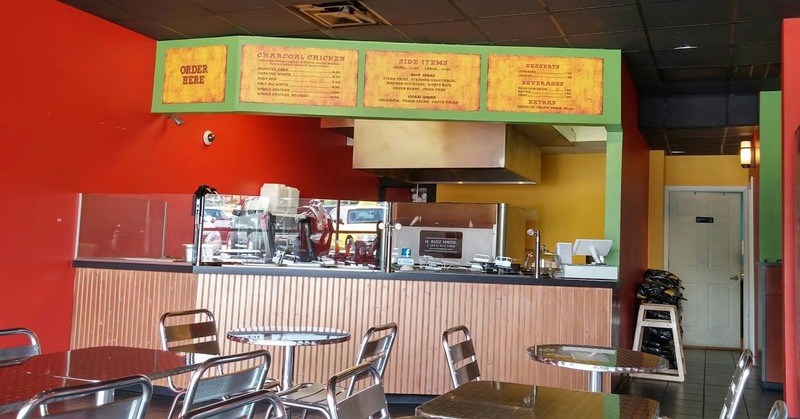 While the menu is large and the food decent, it’s not great Vietnamese food. Here’s my analogy, it’s like going to McDonald’s for a generic burger vs. grilling your own juicy burger at home or invite yourself over to your neighbor’s house for same such delicious burger. If you’re looking to expand your food comfort zone a bit and venture into someone else’s backyard for a juicy burger, er.. great Vietnamese food, you’re in luck. 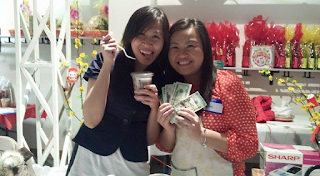 This weekend isTết or Vietnamese New year Celebration and the perfect time to do so. Every year, the Vietnamese Community of Louisville Inc. coordinates Tet for a community of 10,000+ people, attendance is around 400+ people. It is the one event of the year that brings everyone in the community together to celebrate our cultural tradition and heritage. Full disclosure, I’m on the Board so you’re getting some inside info! We coin the term “rubber band time” to describe the tendency of Vietnamese people to show up 30 minutes or even an hour late to an event. The program will start at 4 p.m., but usually the place will not get very crowded until 5 p.m. 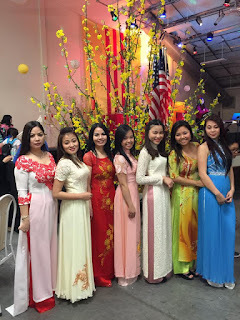 Traditional ao dai. Photo by Nicole V.
A little bit of chaos. 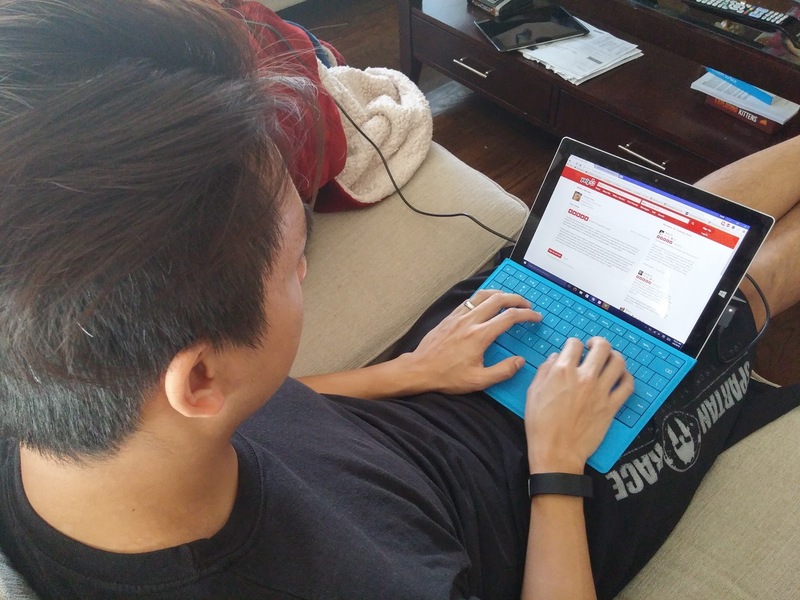 Our community is growing. We’re the second fastest growing minority population (after Hispanics) so expect to see a lot of tight jeans wearing teens and wailing babies. It’s high energy, crowded and lots of people moving about, just like any public event you go too. You’ll just feel hyper aware of it because you’ll be one of the few brave culturally curious souls there that’s non-Vietnamese. You might think everyone is talking about you, but I guaranteed only ½ of them are. Kidding! We applaud and welcome you for getting out of your comfort zone. People will talk during performances in the auditorium, groups will congregate in the cafeteria and hallways. But that’s because this is one of the few events where people get to see each other. 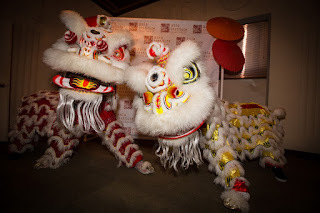 The Louisville Lion Dance Team. Feed the lions money as they dance for good luck! The entertainment lineup consist of a traditional ceremony, local singers crooning new year melodies, traditional and hip hop dances by youth groups, a raffle for a free tv, etc. Special to this year is the Mrs. Vietnamese Kentucky Pageant, its aim is to honor the role of the Vietnamese women in the family and society. Having worked closely with the group, I’m excited to see these courageous, talented and fun loving women on stage. Also, special to this year’s entertainment is a dance retelling one of the most epic revenge stories in the world by two Vietnamese sisters, think elephants and an epic battle to the death. 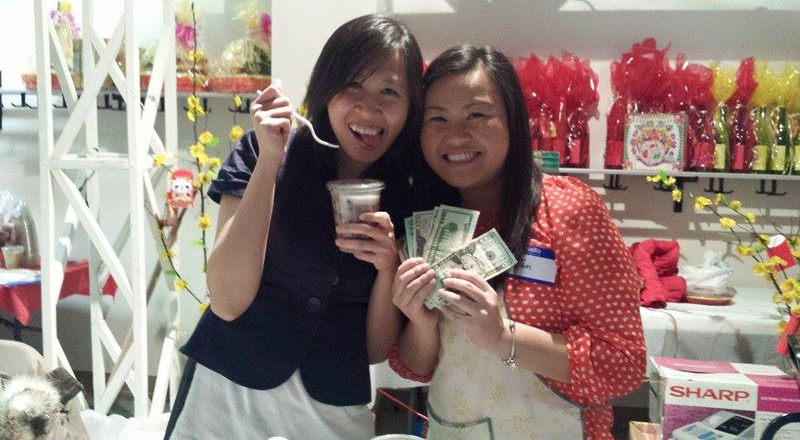 Friendly faces selling foods. Photo by Uyen N.
My favorite part! This is the place to try delicious (cheap) food beyond the Vietnam Kitchen’s menu. You’ll find homemade favorites like banh mi sandwiches, soups (usually pho or bun bo hue), rice crepes, roasted pork, grilled meat and vermicelli noodles, papaya salads, egg rolls, snacks, desserts and drinks. Items vary from year to year. Most of the items are pre-made and on display, so if it looks good, grab it. Not sure what it is? Ask someone, they’ll be happy to help you out. 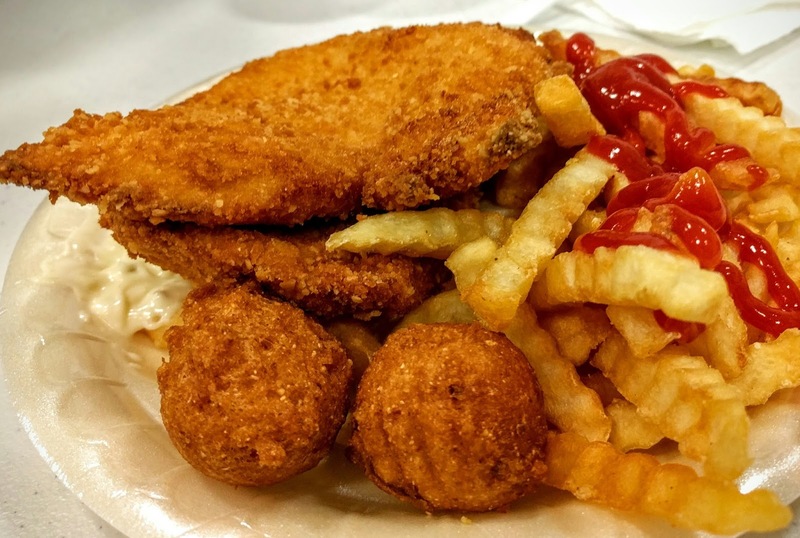 The foods are made by individuals and nonprofit organizations looking to raise money. Cash only. The food vendors will be set up in the cafeteria. After you entered the main entrance, go straight and take a right down the hall way at the end. Cafeteria is on your left. 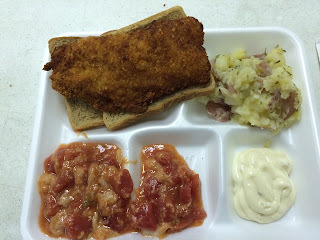 Cafeteria opens at 4:30 p.m. If you venture out, look for me. I’ll be happy to give you a tour! Hope to see you there! 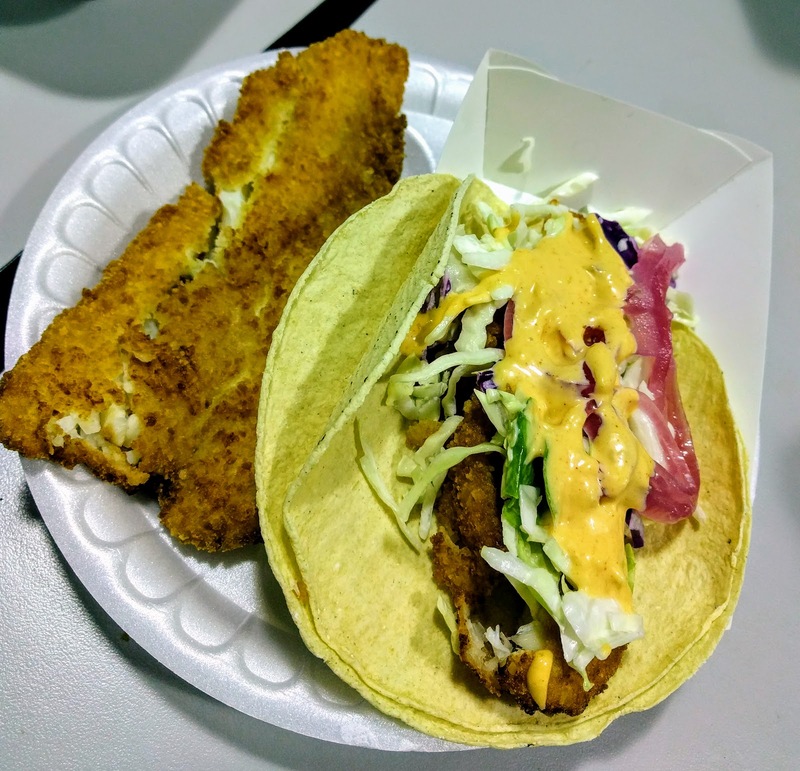 My Catholic husband usually doesn't know the date for Ash Wednesday or even Easter, but if I ask if he knows when and where he wants to go get some fry fish during Lent, he knows the spot and the day: Fridays, St. Bernard for fish tacos. 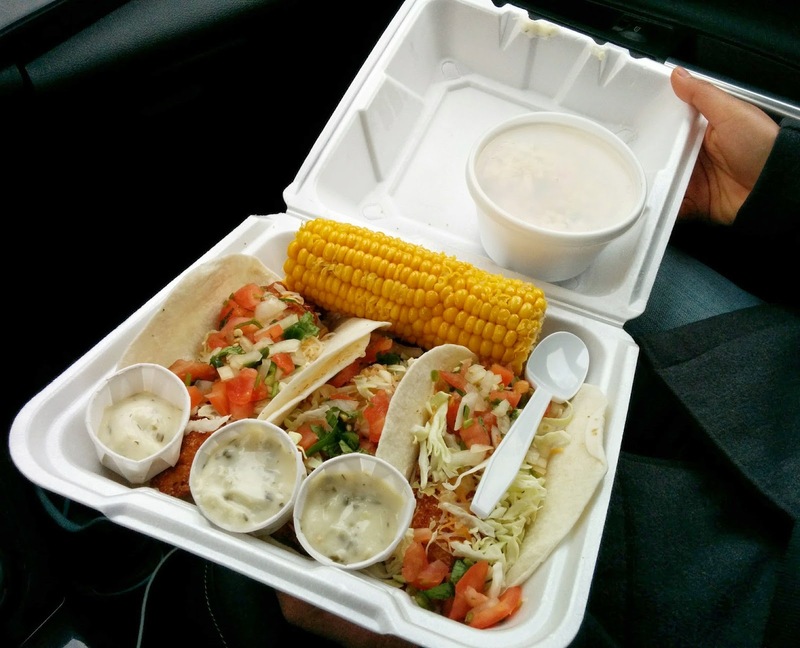 Fish tacos from St. Bernard. We’ve started a new tradition of trying out new fish fries during Lent the last three years at local churches (our experiences in 2014 and 2015). Actually, he’s happy going back to St. Bernard every week. 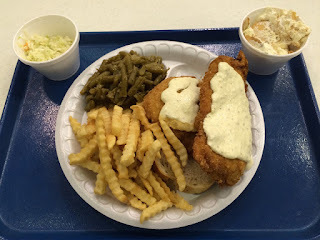 I, on the other hand, love the opportunity to try a different fish fry every week during this Lent season, this year it’s from 3/6/2019 to 4/18/19. So if you’re looking for some great places to try, here’s a list of what we’ve tried and what we are planning on trying this year. You can find a complete list published by the Archdiocese at the end of the page. Entrees usually come with two sides or drinks, homemade desserts and live entertainment. 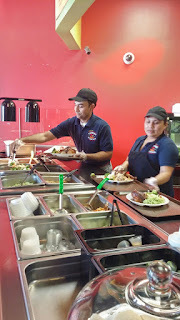 Bring your order form to the food line to get your food. 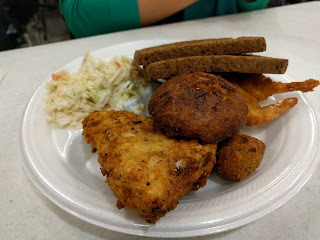 This is by far the smallest fish fry we've been to but it's conveniently located right near Eastern Prkway and Bardstown Rd. Enter from the side of the school (near the playground) into the small gym. 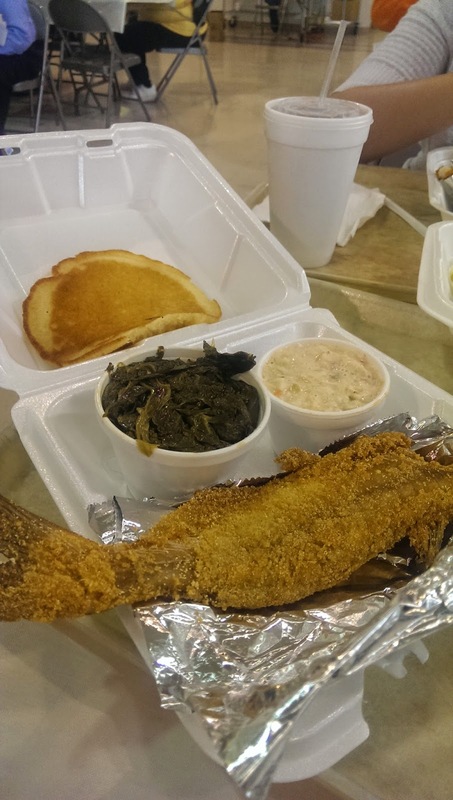 They offer $10 fish, oyster or shrimp dinner with two sides and dessert. 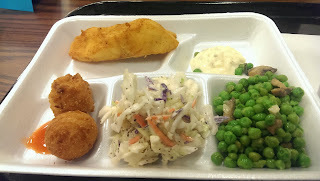 It's basic fish fry fares that bring me straight back to elementary school days. 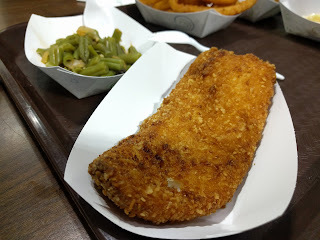 We really enjoyed the fresh, flaky and lightly battered fried fish here ($5) and definitely will be coming back. There's also limited availability of the tacos, $3, though I don't think they are as good. 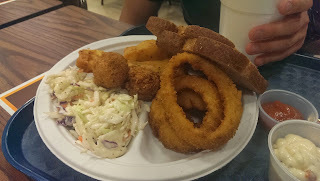 The sides are delicious, ranging from $1.5 - $2 each, especially the fries and the onion rings. The fish fry is in the small cafeteria, so be prepared to share some tables. For seafood lover, grab the friar platter which includes fried codfish, shrimps, hush puppies, pan fries and rolled oysters. The breading on the fish is different from other places I've been as it's ticker and more seasoned, though I'm not a big fan of codfish overall. A good place to try as it's closer to town, offers a few beer selections, and accepts credit card. Complete menu here. 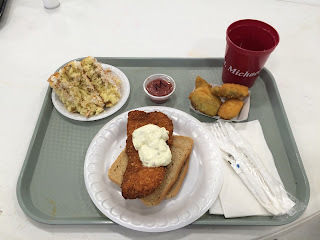 Best thing about this fish fry is that they have a drive through and the sides are delicious! My favorite is the slightly spicy green beans. The fish is your standard breaded fried codfish. For the little ones, there's face panting ($1) and mini golf course ($3) set up in the gym. Twisty winding roads will lead you to this hidden gem. The specialty here is the fish taco, $10 for three large fish tacos, 2 sides and a drink. 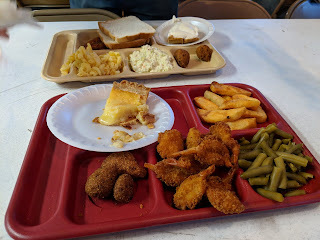 One bite and my husband was immediately in love. The place was crowded so expect a long wait. If you just want tacos (which I highly recommend), there's a shorter quicker line for that but there are no sides in this line. The menu at this place is small, but you really don't need anything else when the fish is as good as theirs. 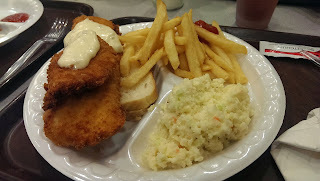 They serve whiting fish, bought from Hungry Pelican across the road, breaded and fried on the premise. The pieces are large and the fish flaky and fresh. It's definitely high on my favorite list. 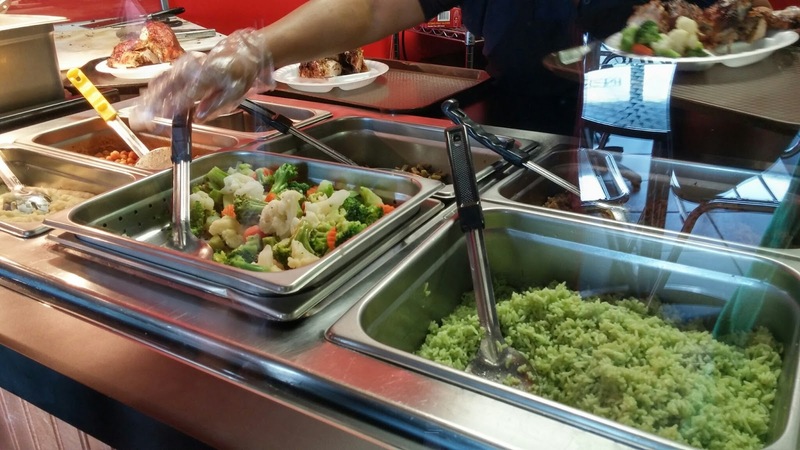 Take out in the cafeteria (full menu) and sit down in the gym (limited menu). Beautiful church in a beautiful and affluent part of town. So far one my favorites as far as hospitality goes. Super friendly hosts that made us feel welcomed and created a warm and inviting atmosphere. You can choose from healthier options such as pan seared tilapia with white wine sauce and vegetables cooked with wine sauce. There’s also boil shrimps, beers and wine (included with dinner, donations accepted). 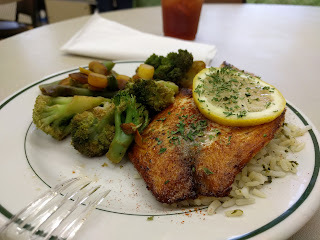 I rarely get the baked fish, but it's hard to resist as soon as I saw it on the food line. It's covered in garlic butter goodness topped with fresh dill (and thyme?) It's a nice change from the fry fish every week. I also enjoyed the lightly battered shrimp. I tried to get a taste of the my husband's fried fish but he finished it before I got the chance. He liked it! It's a great deal, $8 for an entree and 2 sides. 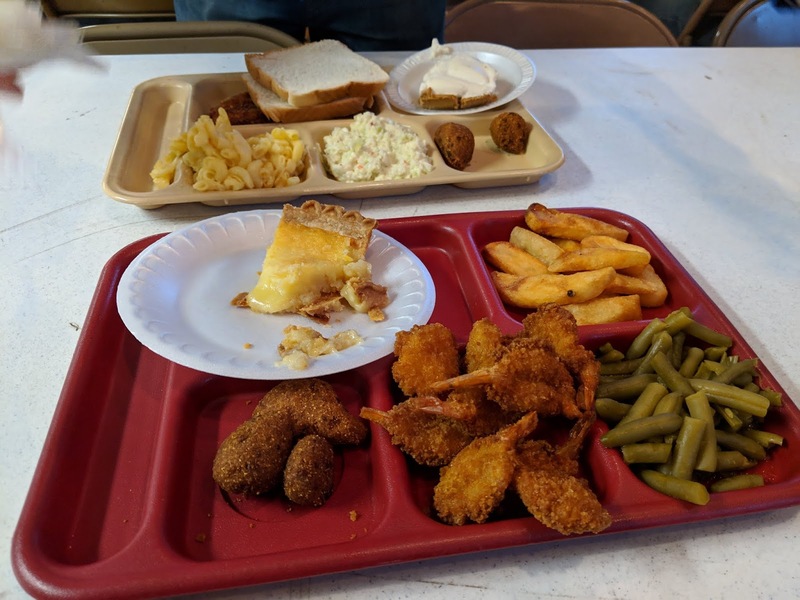 The banana pudding here is reportedly one of the best. This fish fry has a warm and cozy atmosphere. They have a large selection of items to choose from and a lot of homemade desserts. St. Patrick around the Lake Forest area. 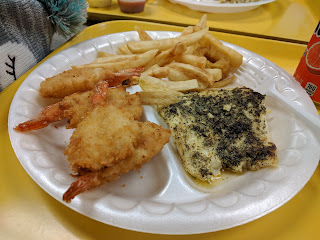 My friend said the food is good. I’ll update them often this season, so check back. Or if you got a great place, let us know! 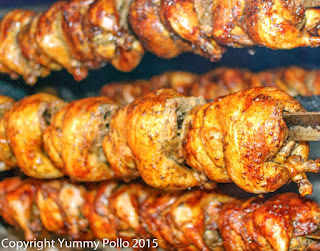 My husband is very easy to please when it comes to food, give him meat and lots of it, and he'll be a happy man. I can count on one hand his absolutely favorite places to eat in Louisville. Today, I'm featuring one of two reviews he's ever written because this chicken place is his absolutely favorite (I like it too but to a lesser extreme). 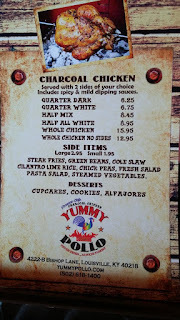 Yummy Pollo - Guest Review by Frank B.
I absolutely have to be floored by a place for me to write something. Even the tablet I wrote this on was about to die which I could of just given up then (wife says I'm lazy) but hell, I was that determined to give this place the recognition it deserves. With mighty spell check in tow (she also says I'm a horrible speller), I carried forth! 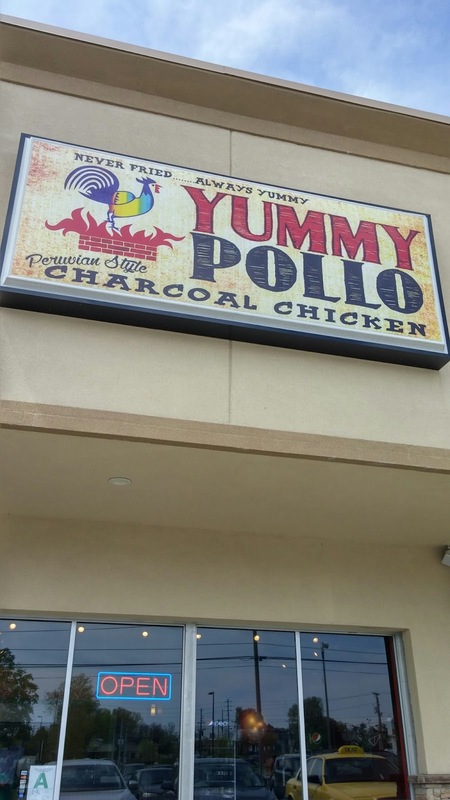 We've tried to eat at Yummy Pollo on several occasions but it was always closed due to it's odd hours but from the little positive word of mouth at the time, we were adamant about trying it and boy am I glad we never gave up. 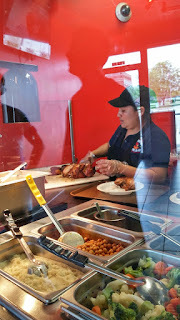 As soon as we stepped inside the owner greeted us with a smile. Each time we come into this place he greets us like we've been friends forever, which my wife thinks I secretly hope for because he's genuinely that nice! The seasoning used for it is amazing. They give you 2 different sauces to try and honestly I could eat the chicken without it. It's that juicy and flavorful. I've been to this establishment quite a few times and it's never disappointed me. The sides are also freshly made everyday ranging from fresh veggies to fantastic yucca fries. 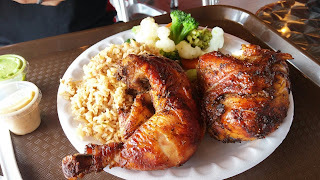 The chicken rice is something I normally get as my side because it complements the main chicken entree very well. What's the price for all this deliciousness? For half a chicken and 2 sides which is what I normally get, it's under 10 bucks! 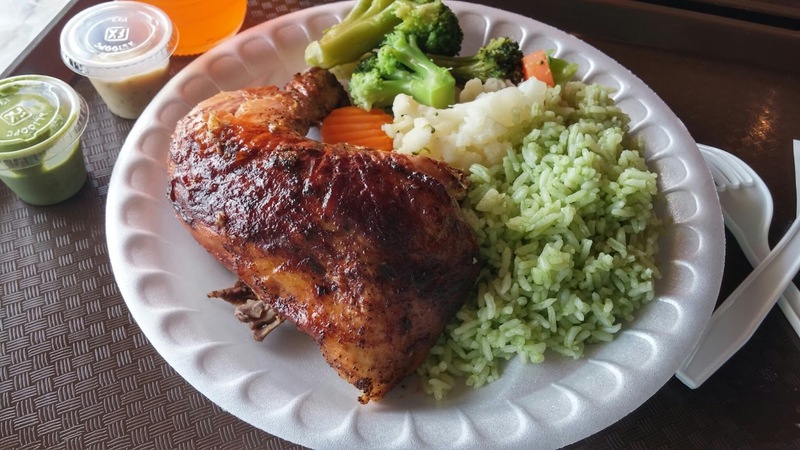 I'm a health nut and I consume a lot of chicken which is one of those things that if you don't cook right, it can be down right bland but Yummy Pollo knows exactly how to make it damn tasty. 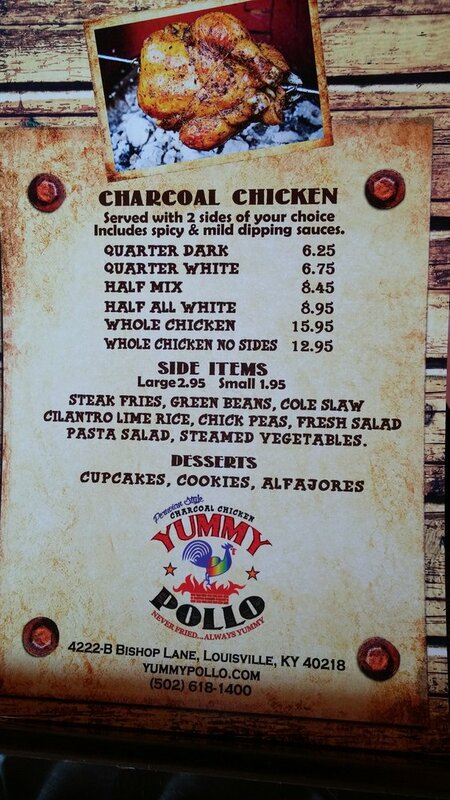 With great food and pricing, you've forever won a place in my heart Yummy Pollo. 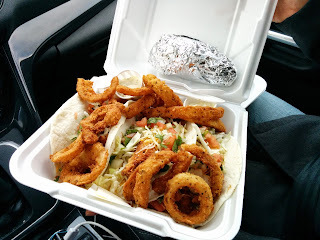 In fact, I've made myself hungry after writing this so I'll see you in a bit! M-F: 11 a.m. - 6:30 p.m.